From 01 Jan. 2009, We have put up all the editions, in other words the complete paper, for easy accessibility on the internet. Read it and let us know what changes/improvements you suggest. Those advices that are technically feasible shall be implemented. Dharitri was launched by the ‘Samajwadi Society’ at Bhubaneswar on November 24, 1974. Blessed with the lofty vision and the searing perspective of great Oriya litterateur Kalindicharan Panigrahi and nurtured by the able hands of his illustrious daughter and the state’s first woman Chief Minister Nandini Satpathy, the paper set out to offer readers a new experience in and taste of reading. It graduated to offset printing in 1986. The paper found its real mojo in late 80s and early 90s of the last century under the guidance of present Editor Tathagata Satpathy. Soon, it became the mouthpiece of the subaltern, in sharp contrast to contemporary dailies that lived off political patronage. As the only impartial Odia newspaper of the state, Dharitri could fast endear itself to vast multitudes of youth, and was the first newspaper to launch special pages and features keeping in mind nuanced interests of its subscribers. Riding on a potpourri of content starting with mint fresh news, infotainment, business features to sports tid-bits, literature and literary critiques, it became number one paper in the capital city, both in terms of numbers and quality of its reportage. It continues to maintain leadership and hold over readers in urban and the state’s countryside. 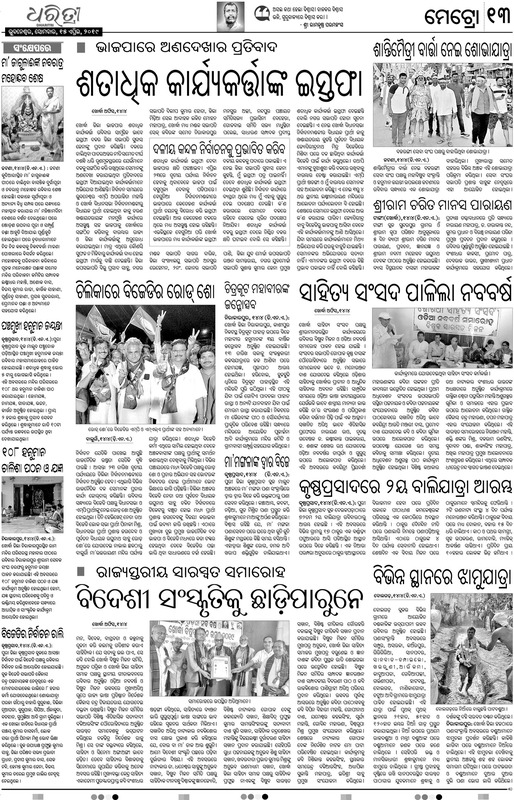 Dharitri made a new beginning in the history of Odia journalism by carrying a special page every day of the week on Youth, Agriculture, Business, Health & Science and such, going far beyond the daily chores of dishing out plain vanilla news. Its weekly special issues such as Sunday Supplement, Children’s Pullout and Literature Supplement have been a huge draw to this day. From day one, the paper has strived to enrich Odia language and literature. Going beyond carrying features of known writers and columnists, it has provided a platform to numerous budding writers through ‘Sahityayana’, a fortnightly literary supplement. It has also given space to new political and economic thoughts that have helped the paper to consistently keep a step ahead of competitors. It also carries regular features for leisurely read and children’s content such as short stories, poems, general knowledge and world events, among others. Dharitri has always espoused the cause of woman empowerment what with its campaign ‘Urja’ (Itz your world), an annual event bringing together girl students from all parts of the state. The spirit of Urja is retained in the pages of the publication even today. Dharitri has been carrying on its campaign to ensure that women get their voice heard. Odisha has a largely agrarian economy. Here, the progress of farmers is tantamount to the progress of the state. Swearing by this maxim, Dharitri devotes a significant chunk of its space to news and features on farming. It is the first and till now the only Odia daily to carry a special weekly feature page on agriculture ‘Krushi Jeevan’ that covers a wide array of content such as organic farming, high yield variety seeds and research-based agri-information that are practical and are being used by farmers across the state. Experts’ views on a variety of subjects such as seasonal paddy, vegetables, horticulture, bee-keeping, pisciculture, dairy and poultry farming and drip irrigation/water conservation are regularly included. Dharitri’s entertainment pages are a feast for its readers. Besides weekly capsule ‘Vichitraa’, it carries daily doses on film, television, yatra and music. It started a customized feature for children ‘Pilanka Dharitri’ to boost the cognitive faculties of children. It carries write-ups, drawings and paintings by children together with their photographs. The supplement, rich with 360 degree information for children, has been a major hit with kids. The paper has been endeavouring to drive awareness on science and healthcare. To address these issues, it began a weekly science page called ‘Swasthya Vigyan (Health Science). It carries features about works of Odia scientists and interesting updates on science and health technology . It also puts a premium on environment and its protection. Dharitri has always been ahead of others when it comes to catering to the interests of youngsters. Weekly tabloid Metro/Man Mizaz has been well received by the youth. The tabloid has caught on with students and youngsters by carrying tailor-made and edifying columns. A regular space for ‘selfie corner’ is a big hit with the youth. It publishes a weekly special ‘Agami Asha’ (Future Hope) carrying inspiring articles for Generation Y. Life is incomplete without sports and none scores better than Dharitri on this. Apart from covering daily sports news, it publishes a weekly sports special with detailed information that include field and track events. The paper stood out among its peers for its sterling coverage of business news, information on employment and career and experts’ columns. It carried a new genre of business news when the idea was yet to dawn on other newspapers in Odisha. Its Sunday supplement ‘Chhutidina’ is a most sought issue for its readers. It’s packed with an assortment of content such as current affairs, features, special days and festivals, history, heritage, customs, travelogues, personalities, films, satire, relationships, fashion, astrology and crime. Elephant, the largest land mammal, is in the middle of a crisis. The man-elephant conflict has come up as a major issue in Odisha. The number of elephant deaths is increasing alarmingly. In view of this problem and as a token of its commitment to environment and ecology, Dharitri launched a novel initiative ‘Hati Banchao, Haata Misao’ (Join Hands, Save the Elephant). This campaign has sought universal participation. It cannot be overstressed that renowned elephant experts such as Prof Raman Sukumar had helped launch this movement. Dharitri has opened a new chapter on the issue of elephant protection in the country and has been diligently carrying regular news and features on this theme. Any discussion on Odia life and culture is futile without a word on Lord #Jagannath. Since its inception, Dharitri has been featuring news, articles and special pages on Jagannath culture, rituals, festivals and services of the deities. ‘Daru Dian’ – its magazine published on the occasion of the #Nabakalebara in 2015—created ripples in the state and beyond. Its regular column on Jagannath titled ‘Aitihara Odisha’ (Heritage Odisha) has made an attempt to publish many facets of the most important Hindu temple of #Odisha. Last but not least, Dharitri, known for its gritty and intrepid editorials, has been highly appreciated by readers for its unmatched courage to speak the truth regardless of whose feathers are ruffled. In fact, Dharitri has been providing wind to its sails of progressive ideology unprejudiced by age old biases. It is also the only paper of the state that holds no brief for any business-mining lobby, nor for any political outfit. It can rightfully claim to be the voice of the common Odia.